A space station 22,300 miles above the earth is Tom Swift Jr.'s latest project! Tom's plans for his gigantic hub-and-spoke outpost of the universe calls for twelve laboratories. Solar batteries will be produced in one laboratory, another will be a celestial observatory, and another a radio broadcasting and TV station relaying programs over one third of the earth. But the project is beset from the start by a fiendish enemy, and also that weird phantom of outer space, Zero Gravity. Tom comes to grips with the problem of weightlessness by inventing a Zero chamber. Here, in order to master the helpless feeling encountered in space, men are trained to develop a new set of muscular reflexes. Crewmen crawling like flies up and down the walls and across the ceiling of Zero G creates momentary comic relief. But this is only a prelude to an exciting drama which takes place on a Pacific island, where Tom's rocket fleet is about to blast off. Strange warnings that terrify the natives nearly wreck Tom's plans. How the young scientist overcomes all obstacles and launches his space station makes a gripping book. And each technical detail of this fascinating story has been carefully checked. For those who enjoy the thrill of adventure and the chill of mystery, Outpost In Space is must reading. There are several very important inventions in this book, and because so much detail has been given on each invention, I will deal with the inventions one at a time and will give each major invention its own complete section. Moreover, because such a wealth of information was given on each invention, I will divide up the information on each invention into several sections. The most important invention in this book is, as you might guess, the Outpost in Space. 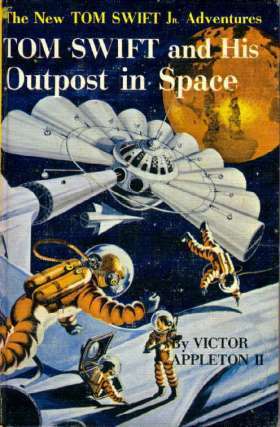 The Outpost in Space is a large space station built by Tom Swift to, among other things, manufacture his solar batteries. Of course, that's not all the 50-passenger space station can do; it is also equipped with a telescope, some communications equipment, and other things. "A space factory where we can manufacture solar batteries." Phyl gasped. "A space factory!" "Only a small one," Tom went on. "I'll locate it in an orbit fairly close to the earth, in order to make the job of building it as simple as possible. Say, a little over a thousand miles up. From down here, you could see it racing around the earth like a tiny moon." "Tom," said his father, "Mr. William Bruce is from the Consolidated Broadcasting Network, and is chairman of this committee of engineers from the major broadcasting companies. They've come to discuss a very important problem with us." The group took seats, then Mr. Bruce addressed the Swifts. "I'll state our problem at once. As you know, high-frequency-signal coverage in its present form is far from being efficient. Distances are short, requiring many relay stations. Sometimes there's distortion. Also, sunspots or magnetic storms may wreck the broadcast completely." "In fact," he went on, "any reliable system of short-wave broadcasting over great distances is practically hopeless with our present methods. However, there's one solution to this problem--"Ö"as a scientist, you've no doubt guessed what Iím about to propose." "A space station?" Tom burst out in his enthusiasm. Bruce nodded. "Exactly. Our committee has come to the conclusion that it's the only way we can hope to lick our broadcasting troubles--that is, by setting up a platform in space to which we can beam radio signals and have them relayed directly back to earth. Naturally, this would be a huge project. But we feel that Swift Enterprises is well fitted to undertake the job." "Your plans certainly seem quite sound. From what you've told us, I'm convinced that the station you have in mind is entirely practical. But a you have already said, the station would have to be placed in a much higher orbit." Then he remarked that it would make the job more expensive to shoot supplies by rocket to such an enormous altitude. But he admitted that from this one station alone, radio or television signals could be relayed to one third of the globe! "A marvelous accomplishment!" Mr. Bruce said enthusiastically. "Later on, if our project is successful, more stations can be built. In this way, we could ring the earth with a foolproof broadcasting system. Think of it, gentlemen--world-wide television would become a reality! We could pick up TV images anywhere on earth and beam them back to viewers right here in America. That is," he added cautiously, "if all countries consent." Mr. Swift remarked wryly that the project would no doubt stir up plenty of trouble from unfriendly countries. "The space station would certainly carry telescopes," he said, "and could detect every warlike move by an enemy. In fact, gentlemen," he concluded, "this will be a very big undertaking from several angles. Therefore I believe the United States Government should be included in the project." "Having trouble, son?" he inquired sympathetically. Tom nodded. "It's the air supply, Dad. I never realized until now the great amount of oxygen the crew of the space station will use up every day. The average man consumes about three pounds of air during a twenty-four-hour period. Even transporting oxygen in liquid form could mean a real supply problem." "Perhaps it might be possible to manufacture your own oxygen," Mr. Swift suggested. "Or, at any rate, enough to supply part of your needs. Day, by a process of photosynthesis." "You mean, by using green plants to give off oxygen?" Tom asked doubtfully. "That's the idea. Of course no ordinary plants would do, but I seem to recall reading somewhere--"
The ender scientist's voice trailed off as he tugged thoughtfully at his lower lip. Suddenly he said, "I remember now! It was in the Annual Review of Microbiology. The writer mentioned some tiny one-celled water plants called chlorella--"
Tom snapped his fingers excitedly. "Of course! I read that, too. In strong sunshine they produce up to fifty times their own volume of oxygen per hour!" "Correct!" Mr. Swift added. "And of course they would remove the carbon dioxide the men exhale. With a few tankfuls of such plants, I think you could supply the oxygen needs of your crew." Tom revised his calculations in the light of this new oxygen supply. A moment later he looked up triumphantly. "Dad, you're a wonder! I think chlorella may be the answer." Grinning, Tom added, "Why don't you come around here more often?" As one might guess, this did the trick! "It looks as if we have the oxygen supply problem licked, Tom. Thanks to your dad!" "By using those chlorella algae?" Tom asked, referring to the tiny green water plants. "Right. We've just finished running tests on the stuff. In strong sunlight, five tankfuls of those plants will absorb carbon dioxide and give off enough oxygen for a crew of fifty men!" "Fine. How big are the tanks?" "Five feet square and filled to a depth of one inch," replied Grady. "They're in a greenhouse on the roof." Incidentally, the idea of "growing" your own oxygen has been around for a long, long time. It's a good solution and will eventually happen, but today it just isn't practical. "How about the moisture problem?" "We're working on that." Grady pointed through a glass window to several men in a sealed test chamber that was filled with a foglike haze. "According to our estimates, a man needs about two quarts of water a day. Half of it he gives off to the atmosphere by breathing and evaporation. That much we can recover, purify, and use over again." "The rest we'll have to bring up, I suppose," said Tom. "Right. About one quart per man." Tom rubbed his chin thoughtfully. "Well, we can save the weight of containers by bringing it up frozen into cakes of ice." Grady snapped his fingers. "Tom, that's an idea! As the ice melts in the space station, it'll take part of the load off the air-conditioning system, too!" Mir has a closed loop life support system. The costs of resupply from the ground are prohibitive. Water which has been transported to the cabin atmosphere through evaporation and through breathing is recovered as humidity condensate using condensing heat exchangers. Water which has been used for personal hygiene (containing a variety of substances including salts, soaps, hair and other particulate matter) is collected for purification. Urine is also collected for treatment. Currently, these three sources form the primary inputs to life support water reclamation systems. Disinfectants are added to the reclaimed waters to prevent the growth of pathogenic microorganisms. Water contained in feces and other solid waste is lost from the system and is made up by onboard water production facilities or periodic resupply. Three separate water purification loops are used onboard the Russian Mir space station. Urine is purified as a feed to the electrolysis cells which generate oxygen. Hygiene water is reprocessed for re-use only as hygiene water. All potable (drinking and food preparation) water aboard Mir comes from the purification of humidity condensate or from resupply. This is similar to the original water reclamation scheme for the ISSA (International Space Station Alpha). "What about the heat from all the solar radiation out there in space? Won't that run pretty high too?" "You're so right," Tom admitted ruefully. "I figure that the outside temperature of the space station may run close to 1,500 degrees Fahrenheit. Which means we'll need a terrific cooling system for the setup." "And a heating system, too," Sandy put in, recalling a discussion with her father. "Dad says it gets down to 459 degrees below zero during the two hours of darkness." "Really?" Phyl was surprised. "The earth doesn't get that cold." Tom explained that the earth and its air blanket retained the sun's heat during the night hours. "It might seem chilly," he added, "but by comparison with outer space, a zero winter's night is mighty cozy." "What's being done to lick this heat problem?" Bud asked. "Well, for one thing," Tom said, "The station will be built of magnesium with a highly polished, almost white surface. In that way, it will reflect the heat rays rather than absorb them. Also, the station will be coated with Tomasite for further protection. And inside, it will have a double wall of thin steel with more insulation sandwiched in between." How did Tom cope with the lack of gravity in outer space? When Tom Swift was building his space station nothing was known about the effect of weightlessness upon a person's health. Tom had to guess, then, what weightlessness would be like, and by and large he did a pretty good job. "By the way, what are you doing to offset the lack of gravity up in space? Have your station spin all the time to produce artificial gravity?" Tom replied thoughtfully, "Iím not sure that's necessary, Dad. When Bud and I took our ride around the earth 1,075 miles up we were not bothered too much by the feeling of weightlessness that comes with lack of the earth's gravity holding you down." "But you were aloft only a little over two hours," Mr. Swift replied. "Some experts believe that human beings couldn't survive long without gravity. Their nervous systems might not be able to stand it for extended periods of time." Tom went on to say that a feeling of weightlessness was not unlike a feeling of helplessness. "One would have to learn how to do everything a different way--eat, drink, move, work. And I see no reason why some of that can't be done right here." "You're way ahead of me, Tom," his father admitted. "Have you cracked the impossible, son? Are you going to produce zero gravity here on earth?" "No, Dad. But I am going to build a transparent, sealed room outdoors [indoors] about twenty feet square and fifteen feet high, which we'll call the Zero-G chamber." Tom considered for a moment, drumming his fingers on the workbench. "Well, you know how a piece of metal can be floated between the poles of a rapidly pulsating magnetic field. I'll use the same principle." "But human beings aren't made of metal." "No, but I believe a metal suit could be designed to produce the same effect. A person floating in the air chamber would feel mighty helpless. Now if he had to find out how fast or slow he had to propel himself to try to reach, say, a hammer that was floating too, and then go after nails and wood also in the air--"
"I see," said Mr. Swift. "You'd be overcoming some of the problems you'd meet up in space." "Exactly. I'd add this test to the others that my crew would have to pass in order to become spacemen." The elder inventor looked impressed. "You may have something there, son. It's certainly a good idea. And if it's found that continuous lack of gravity isn't advisable in your space station, you can always start it spinning to set up artificial gravity." Tom's test chamber had one flaw, however: it could not test the effects of prolonged weightlessness upon a person. 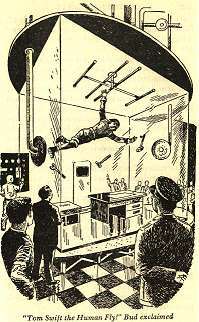 For short periods, Tom Swift is right: weightlessness does indeed has little effect upon a person. Over longer periods, however, a person's health and muscle system rapidly deteriorates. This is something that his chamber could not predict, and as a result he couldn't foresee any problems. Still, if there were any problems to weightlessness Tom planned to give gravity to the station by spinning it, as is related in the following question. We could make it rotate, Chow," replied Tom, "if we wanted to set up artificial gravity." Tom attempted to explain. "You see, Chow, once we get out there in space, everything will seem weightless. We'll just float around with nowhere to fall to, because there won't be any up or down. But some people might not find that very pleasant. So the answer would be to start the wheel turning." "What good would that do?" Chow asked, still mystified. "Ever seen what happens if you twirl a ball around and around on the end of a string?" "Why, brand my radarscope, any jughead knows that. The speed keeps the string taut with the ball being pushed out." "Right. So if the wheel started spinning around, everything inside would tend to push out toward the rim. In other words, for the spacemen inside each spoke, 'up' would mean toward the wheel hub and 'down' would mean toward the rim." Ö"This station is a very original design," he commented. "Like three spokes in a giant wheel." "Yes," said Tom. "We could add as many spokes to the hub as we wish. Would one or two be enough for your broadcasting purposes?" The engineers felt hat they would need three for commercial broadcasting. "And I believe the government would want one," Mr. Swift remarked. "This is really what our space station will look like of we ever get it built. You see, each spoke of the wheel will actually be part of a rocket. But we won't connect them to the hub until after we shoot them out into space." "You mean, people are going to live inside this contraption?" "That's right. The whole thing will be hollow. And each spoke will be a separate compartment for one particular use." "Like for instance?" Chow queried. "Well, some will be observatories, others labs. Some will be for manufacturing our new solar batteries, and some will be used for broadcasting or telecasting. Of course the crew will be able to go from one compartment to another, either through the hub or through these connecting alleyways that form the outer rim of the wheel." "And how would a critter to about getting inside in the first place?" "Through one of these ports at the outer end of each spoke," Tom said, pointing to the model. "Whenever a supply rocket comes up from earth, it will nose right into an opening and unload." "After outlining his plans, Tom showed them the model of his proposed outpost in space. "These two sections," he said, pointing, "will be assigned to astronomical work. Of the others, two will be used for making solar batteries, three for commercial broadcasting, one for government broadcasting, one for medical purposes, one as my private lab, one for sleeping quarters, and one for dining and recreation." "Now let us show you our plans for the space telescope." He unrolled a sheaf of drawings. "As you can see, the optical elements will be held together by a mere spiderwork of wires. The heavy mirrors will be weightless out there in space, so this is all we'll need to brace them rigidly." Compared to giant telescopes used on earth, the space telescope would be small. But Dr. Harlow explained that it would give a much clearer, sharper picture of the heavens because there would be none of the earth's atmosphere to blue out the view. "Think how the skies will open to us!" the white-haired astronomer said enthusiastically. 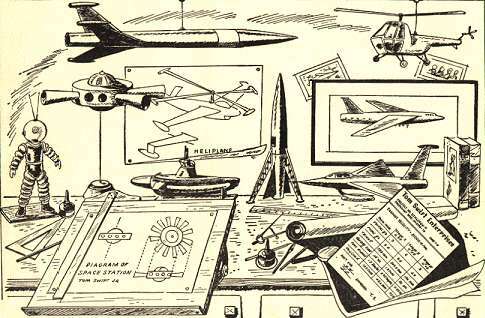 That telescope, by the way, was later replaced with one of Tom Swift's fantastic Megascope Space Probers. Tom checked every bit of equipment carefully. Ken HortonÖwas intrigued by the weird-looking suits for the crew to wear while assembling the outpost in space. Made of tightly woven-wire fabric to withstand tremendous bursting pressure, the suits were coated with synthetic rubber both inside and out to make them absolutely airtight. The helmets were metal, with tinted transparent plastic visors to see through, and contained radio sets for talking back and forth with other crewmen. "I'll sure feel like a being from another planet in one of these." Horton laughed. "Tell me more about them." Tom explained that each suit would be provided with its own oxygen supply and air-conditioning equipment. "That's really necessary, isn't it?" Ken commented. "It is, if we hope to survive any accidents out there in space," Tom replied. "Well, suppose a meteorite plowed a hole through one of the walls of the space station. All the air would rush out of that compartment, ad the men who repaired the damage would have to work in a temporary vacuum. Without these space suits, they'd suffer explosive decompression." "Yes," said Ken. "The air in their lungs would explode outward and the blood would boil in their veins! It's a horrible thought." "That's why everything has to be figured out so carefully beforehand," Tom commented. "Brand my neutralator, you got a regular rocket city built up on this little ole island!" He gaped at the vast extent of the humming base, with its miles of machine shops, commissary, barracks, and recreation areas. Special docks had been built for the fuel tankers and salvage tugs. And the hangars and warehouses were crammed with supplies and part assemblies for the outpost in space. 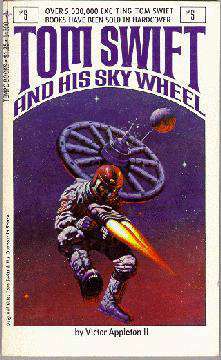 Amid great fanfare, part of the first section of the giant space wheel was blasted aloft in an unmanned cargo rocket. The rest of the great central hub was sent up shortly after lunch. "No one," explained Tom. "once they reach the orbit, they'll just float around up there till the space crews arrive to unload them." "This is a big moment for all of us. You're leaving on one of the greatest voyages in human history. Good luck and we'll join you soon!" Blast-off proceeded smoothly. Tom stayed with the radar-tracking crew, exchanging signals with the rocket until it reached the orbit safely about one o'clock that afternoon. At eight that evening, rocket Number Two took off, with Hank Sterling in charge. It contained the crew's bunkroom section of the wheel. Next day, two more rockets were launched on the same time schedule--one at eight A.M., the other at eight P.M. The first was the mess hall and recreation spoke of the space wheel; the other, the observatory in which the telescope would be mounted. Like the other rockets designed for this project, it dropped off only two stages en route. The third stage, which was hauled clear up to the orbit, would come apart in three sections. The center would become one of the spokes of the space wheel. The nose and firing engines would be coupled together and would be used to ferry spacemen back to Loonaui whenever that became desirable. Rocket number 12, by the way, was the last rocket to be launched. The crew spent the rest of the afternoon going over the operation of the tiny one-man rockets which they would use for their construction work in space. Motive power was supplied by swivel-mounted reaction pistols in back, fired by triggers inside the rocket. "And remember," Bud warned them grimly, "keep these babies attached to your mother ship by a cable at all times. Otherwise you may blast yourselves off into eternity!" An awesome sight met their eyes. In the starry blackness of outer space floated a great silver wheel hub, with huge holes where the twelve spokes would be connected. Ranged around it were the first four rocket ships. Swarming all about were tiny space-suited figures and midget construction rockets, tied to their mother craft by long lines. Working with cables and winches, the men were trying to maneuver the rocket ships into their hub holes. The next step was to weld the spoke in place. The nose section was then unscrewed and wormed back through the hollow spoke. A crew outside in space suits then sent it off to a distance of a hundred feet to await further use as a ferry to Loonaui. The great silver station was now a more imposing sight than ever. Besides the latticework telescope poking out from the astronomer's observatory, the wheel also bristled with radar scanners, and radio and TV antennae. From the factory sections, wedge-shaped lids opened up, revealing polished mirrors to catch and reflect the sun's rays in toward the solar-battery assembly line. Where were the rockets launched that launched the parts of Tom's Outpost in Space into orbit? "Have you decided where your rockets for it will be launched?" Phyl asked Tom. "Dad's negotiating for a site on a Pacific island near the equator," Tom replied. "The launching area has to be somewhere in mid-ocean, so that the first two stages of each rocket can be dropped off safely after they're burned out." "It's a tiny spot called Loonaui--hardly a speck on the map. We've just received clearance." He now showed Ken the midget one-man rockets that he had designed for the project. Each one had a pair of jointed, robotlike arms, controlled from inside, for handling tools or manipulating objects in space. 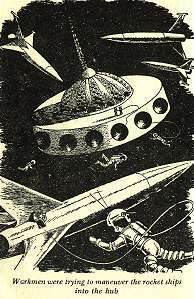 The crewmen would "fly" around in these midget rockets while constructing the outpost or doing any outside work." "Twenty-two thousand miles would be better for broadcasting purposes," Mr. Swift spoke up. "And the station should be in a path directly above the earth's equator, I suppose." "Yes," said Mr. Bruce. "At that altitude the space station would revolve in its orbit once every twenty-four hours--exactly in time with the earth's rotation. And above the equator it would remain fixed above the same geographical spot at all times, which is what we would need." Sketching in the sand with a sea shell, Tom went on to describe how the rockets would take off straight upward, then gradually tilt to an easterly course. After climbing to a height of 22,300 miles, they would finally level off. "After that they will travel in one orbit, keeping opposite the same spot on earth at all times." "You mean the space station will stay in that location?" Phyl asked. "Good night!" said Sandy. "Won't it have to travel horribly fast to do that?" "A little over 6,800 miles per hour." Tom grinned. "Which works out to about 1.9 miles per second." Phyl shivered. "Golly, it makes me dizzy just to think of it!" Chuckling, Tom added, "All of us are whirling through space pretty fast right now. In fact, a person at the equator is traveling at a speed of a almost a thousand miles per hour. We're doing a little less." "I believe a point directly above Loonaui will be the best spot for our space station." How feasible is it to build an Outpost in Space? This is one question that has answered itself! Since this book was published there have been a number of space stations: there has been the Skylabs, Mir, and others. Come 2002, in fact, the construction of another space station (the International Space Station) will be completed. So, obviously, it is possible to build a space station. Building a space station the size of Tom's, however, is a problem. While the size of Tom's station was never mentioned anywhere in the book, it is obviously far larger than any space station we've ever built. Replicating Tom's space station is, however, quite possible, and only poses a large number of technical difficulties. The problem with creating a space station that is that large is in the price: who is going to pay for it? Tom had it easy: he was able to split the cost between the wealthy Swift Enterprises, a large network company, and the US Government. Demand for such a station back then was high, especially since satellites had not came into existence yet. Over the years, however, the demand for a space station has decreased, largely because of the debut of satellites. Anything that a space station could have done, a satellite can do much cheaper and more efficiently. That's not to say, however, that Tom's space station will never be built. Should we ever decide to colonize other planets in a major way, we'll have to build a large space station to construct rockets in-orbit. How much impact would the Outpost in Space have on civilization? As I said in the previous question, any demand that Tom's space station would have had has been realized by the debut of satellites. Satellites, as we all know, allowed extraordinary things to happen: among other things, we can monitor the weather (and enemy countries), we can call people on the other side of the globe, we can watch TV world-wide, and we can use the Global Positioning System to pinpoint the location of objects and people. The world has been dramatically changed by satellites; were we to remove every satellite from orbit we would find the world to be a strange place indeed. Tom's space station, however, did have many advantages that satellites do not. For example: a space station can be used to conduct in-orbit and zero-gravity experiments; it can be used to grow high-quality products that can only be produced in microgravity; it can be used as a base to construct rockets in-orbit; and it can be used as a stopping place on voyages to, say, Mars. The exact value of a space station will be determined soon. NASA is scheduled to begin the construction of the International Space Station soon. Once it is completed sometime in 2002, we will at last start realizing the value of a permanent space station. Another important invention in this book is Tom's amazing Solar Batteries. The solar batteries are just what they sound like: normal, ordinary devices that store electricity. The "solar" part comes from the fact that they get their electrical charge from a one-time exposure to the sun's rays. So what's so amazing about a new kind of battery? Simply the amount of electricity they can store. Think of a solar battery as being the ultimate in batteries: one small, featherweight battery can hold enough electricity to power a car for the life of a car, and a larger group of batteries could be used to power an ocean liner for the life of the liner. They're simply incredible. Add to this the fact that they receive their charge from the sun, and you have a pollution-free, nearly-infinite source of energy. How did Tom's Solar Batteries work? As one might guess, the book didn't say a word about how the solar batteries worked. All we know is that they get their electrical charge from a brief exposure to high-intensity sunlight. Somehow, that brief exposure to sunlight causes a violent change in the electrical states of the battery -- so much so that, if that charge is held, it can take years to return to a normal, uncharged state. Soon the altimeter needle was approaching the 85,000-feet mark againÖTom's new solar battery had been mounted in an aperture in the dome for exposure to the rays of the sun. At high altitudes the rays were more powerful than in the denser air blanket surrounding the earth. Wires from the battery were connected to a voltmeter and other electrical instruments. When the young inventor returned to the flight deck, his face wore a disappointed frown. "The voltmeter reading is way down," muttered Tom thoughtfully, running his fingers through his blond crew cut. "That the battery's efficiency for storing electricity will have to be improved. In other words, the battery will take a charge but won't hold it properly. I'll have to try some other method. To fix this problem, Tom Swift spent some time in his laboratory redesigning the metal in his battery until he had it just the way he wanted it. The redesign, by the way, worked great; in fact, Tom said that the metal worked out better than he had hoped for. "What in the name of aerodynamics was that?" he gasped. Tom grinned wryly and said, "Crazy s it may sound, that flash of light proved our experiment is a big success." "Come here. I'll show you." Tom led the way to the burned-out rocket and pointed to the now-blackened porthole. "Notice what's happened to the metal frame around the quartz window?" he remarked. "Wow!" Bud exclaimed. "It's fused solid to the metal shell of the rocket. The heat from that flash must have ben terrific." "Right," Tom agreed. "Which means our battery picked up a sizable charge out there in space." "Then this foil you developed is going to work!" Bud responded enthusiastically. "Well, the sol-alloy did become energized by the solar radiation," Tom explained. "In other words, a big percentage of its free electrons was energized to highly excited states and trapped there on the surface of the metal foil. But the trouble is that they didn't stay trapped." "You mean the battery short-circuited somehow?" Tom nodded. "That's what caused the flash. Apparently the sol-alloy is very unstable when it's in a charged state. So now the stuff is to figure out a desensitizer for the stuff--something to keep it from discharging all of a sudden as it did just now." "It oxidized completely when that flash occurred," Tom muttered. "Cheer up, pal," Bud said, clapping him on the back. "Just be glad you didn't oxidize along with it." Tom smiled, then became serious. "If a commercial battery ever failed that way," he said, "no buyer would touch another with a ten-foot pole. It could ruin our whole market overnight." "Hey, what happened to the color of our sol-alloy?" he asked with a puzzled look. "It's darker than it was." "That's because of the desensitizer I've mixed with it, so that the stuff won't pop off like a flash bulb the second it gets down to our atmosphere," Tom replied. The young inventor explained that he had used as a desensitizing agent a trace amount of a transitional metal sulfide. He had incorporated it in the sol-alloy when it was smelted. "And now we'll put together a four-cell battery," he said. "What happens if the old sol-alloy oxidizes again?" Bud asked. "It'll blow the rocket to smithereensÖ"
Bud watched with intense curiosity as his friend smelted small quantities of several metals together in a small electric furnaceÖ Finally he felt he had the right combination. The alloy had a high degree of malleability. "Now we'll put this through the rollers," he told Bud, leading the way to a workshop full of heavy equipment. Tom pushed a wall button, setting a series of highly polished steel rollers into action. Into them he fed the hot metal, which finally was reduced to a thin sheet. "Your mother couldnít have done better with a rolling pin," Bud quipped, as Tom trimmed and cut the foil in a shearing machine. Tom rolled up four sheets of the sol-alloy and inserted them into cylindrical cells made of a plastic he had invented which he called catalium. Then he filled the cells with a liquid ammonia under pressure. As each cell was fitted, Tom sealed it off. Finally, when all the cells were ready, he assembled them in a battery case made of catalium. He handed it to Bud who gave it a surprised whistle. "This is so light a child could lift it easily. Man, wait until the automobile makers get wind of this!" Tom chuckled. "Bud, if that one battery you're holding works out, it'll supply enough power to run a whole fleet of cars!" "Hang on to your space hats!" cried the young inventor with a broad smileÖ "Each cell tests better than two hundred volts and it will be easy to make batteries with a line voltage of a thousand or more." Tom spent the rest of the afternoon rigging up a special test chamber. Inside it, the battery would be connected to a heavily overloaded circuit and at the same time undergo extreme conditions of temperature, pressure, and electrical stress. "What's all this supposed to prove?" Bud queried. "It'll show how well the desensitizer can do its job," Tom explained. "Twelve hours in this chamber will drain the battery as much as six months of normal use would. If that voltage needle points anywhere near as high tomorrow as it does right now, we'll know we've got something!" At breakfast the next morning, the two boys hurried to the laboratory. By this time, the battery had undergone almost fifteen hours of testing. Tom removed it from the chamber and quickly hooked up the leads for another reading. To his delight, the voltage had dropped only a minute fraction of one percent! Tom was jubilant. "Bud, this means the battery has a terrific efficiency! It should last for years--and you've seen how lightweight it is. It's just what we need for powering all the equipment our outpost in space!" "Tom , if this new invention of yours is half as useful as your preliminary report indicated, it should find quite a market." ""You be the judge, Uncle Ned," Tom said, brimming with confidence. "A battery one-tenth the size of this will provide enough energy to run an automobile for the life of the car. On the other hand, we can easily make one big enough to power an ocean liner." "But that's not all. These solar batteries will find particular application wherever the weight factor is all-important, as in aircraft and rocketry. And how about pocket-sized arc welders and dentists' drills?" "What about the cost?" Uncle Ned interjected. "They'll be high-priced to start with," Tom admitted. "But in terms of long life, they may well turn out to be the cheapest form of power known." How feasible is it to build a Solar Battery? Well, it depends. I think that, with a little trouble, it would be possible to build a battery that received its electrical charge from sunlight. In fact, I think that you are currently able to buy a battery recharger that recharges batteries via a large solar cell. However, building a lightweight battery that could hold such a charge "for years" under heavy use is clearly out of the question, even if you aren't concerned with making it lightweight. After all, consider: automobile makers would love to have a battery that could power a car for 200 miles between charges. Clearly, making a battery that can power a car for 250,000 miles between charges is ridiculous! How much impact would a Solar Battery have on civilization? A solar battery would undoubtedly have an enormous impact on civilization. Everyone would want one: airlines would want them to power their airplanes, car manufacturers would want them to power their cars; engineers would want them to power machines. Indeed, the world would undergo a revolution in the way it powers its objects. Power plants might be a thing of the past, for why bother to have a central producer of electricity if each object can power itself for as long as it lasts? The last major invention in this book is the Zero-G Chamber. Tom needed a way to both test the effects of weightlessness upon a person and to train his astronauts how to work in microgravity. To accomplish this, he built a special chamber that simulated microgravity by the use of magnets. "Tom," Phyl asked, as she stared wide-eyed through the transparent plastic walls, "do you expect to overcome the law of gravity in there?" "No. But I hope to imitate the helpless feeling one would have if he were weightless," Tom explained. "My body won't be weightless, although it will appear to be when I'm inside the chamber in a special suit made for the experiment. The buoyancy of my suit in the pulsating magnetic field will exactly compensate for the weight of my body." How was Tom Swift's suit designed? The suit that Tom used in the Zero-G chamber had to be specially designed. As Tom Swift Sr. pointed out, people are not naturally metallic and therefore are not naturally repelled by a magnetic field. "Where's this suit that you're going to wear, Tom? Mother and I want to be sure it fits right." Tom winked. "It's the latest fashion on Mars," he said. "If you'll excuse me, I'll go put it on." Tom returned in a few minutes. His appearance drew a loud buzz of interest. 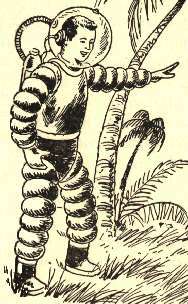 From head to foot, he was clothed in a weird, tight-fitting metal suit resembling fish scales. Slits had been left for his eyes, ears, and nose. The suit had been tailored especially for Tom and was made like a bulletproof jacket. It was composed of a myraid of tiny soft iron disks, sewn together on a fabric backing. The disks were built up like the flesh on his frame, clustering most heavily on the thichkest parts of his body, whereas the gloves encasing his hands were fairly thin. "Well, brand my lariat, a walking hardware store!" Chow excplaimed. "How can you ever move around in that there suit o' armor?" "Feels a bit heavy, all right." Tom chuckled. "But I'm expecting the Zero-G chamber to change all that." "Do you think a space crew will be able to adjust all right to zero gravity?" Horton asked eagerly. "I'm sure of it, Ken," Tom replied. "But we'll all need careful training to develop a new set of reflexes for weightlessness." How feasible is it to build a Zero-G Chamber? Technically, building a magnetic zero-g chamber is ridiculous. The technical problems alone are enormous, and when you add to that the constant computer coordinating that must be done to keep the effects of weightlessness, you are left with a problem of major proportions. However, there are other ways to simulate microgravity. Ever notice that, when you fall, you appear to be weightless? Well, NASA got a bright idea: what it does is it takes a specially built 747, fills it with some astronauts, flies it up to 40,000 feet, and then sends it on a controlled "fall" toward the ground. During that fall, the conditions inside the plane exactly match the conditions in microgravity: people can float, for example, and water will not pour. Another way that NASA uses is to drop an astronaut (spacesuit and all) into a swimming pool and weigh him down until he is neutrally buoyant. When he is neutrally buoyant microgravity is again simulated: he can seem to "float", and he can (among other things) work upside down. Update 5/3/2002: I received in the mail some time ago the following tidbit from a fellow by the name of Paul. Sounds like Tom wasnít the only person with the idea for the Zero-G chamber! At one point there is a "zero gravity" chamber that uses magnatism to simulate null gravity for space flight training. Two people wear metallic clothes and demonstrate for the investigator. This seems very similar to the zero gravity chamber in TS Jr. #6. Very interesting!! I wonder if there was a previous mention of such an idea that both drew from or if this movie was the inspiration for the idea?